The Union Cabinet, chaired by the Prime Minister Shri Narendra Modi, has approved the proposal to introduce the Negotiable Instruments (Amendment) Bill, 2015 in Parliament. The amendments are focused on clarifying jurisdiction related issues for filing cases of offence committed under Section 138 the Negotiable Instruments Act,1881 (NI Act). The main amendment included in this is the stipulation that the offence of rejection/return of cheque u/s 138 of NI Act will be enquired into and tried only by a Court within whose local jurisdiction the bank branch of the payee, where the payee presents the cheque for payment is situated. Section 138 of the NI Act deals with the offence pertaining to dishonour of cheque for insufficiency, etc., of funds in the drawer’s account on which the cheque is drawn for the discharge of any legally enforceable debt or other liability. Section 138 provides for penalties in case of dishonour of cheques due to insufficiency of funds in the account of the drawer of the cheque. The object of the NI Act is to encourage the usage of the cheque and enhancing the credibility of the instrument so that normal business transactions and settlement of liabilities could be ensured. The clarification of jurisdictional issues may be desirable from the equity point of view as this would be in the interests of the complainant and would also ensure a fair trial. 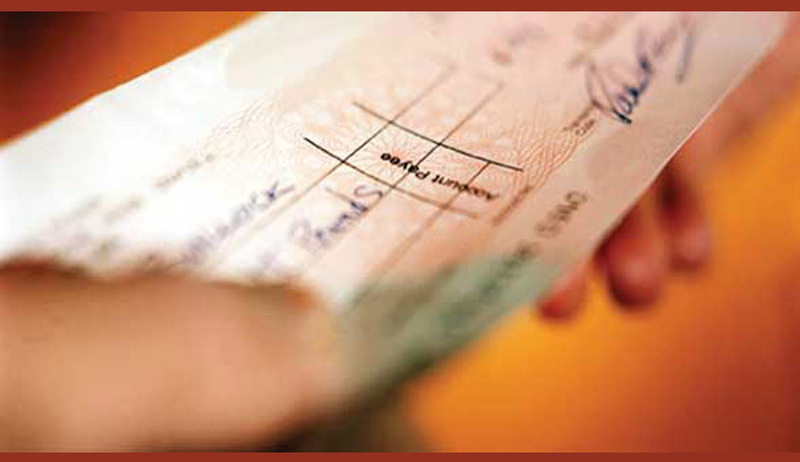 The clarity on jurisdictional issue for trying cases of cheque bouncing would increase the credibility of the cheque as a financial instrument. This would help trade and commerce in general and allow lending institutions, including banks, to continue to extend financing to the economy, without the apprehension of the loan default on account of bouncing of a cheque. Action will be initiated to introduce the Negotiable instruments (Amendment) Bill, 2015 in Parliament in the second phase of the current Session of Parliament. It was in Dashrath Rupsingh Rathod vs. State of Maharashtra a three Judge Bench of the Supreme Court held that a Complaint of Dis-honour of Cheque can be filed only to the Court within whose local jurisdiction the offence was committed, which in the present context is where the cheque is dishonoured by the bank on which it is drawn. The Court clarified that the Complainant is statutorily bound to comply with Section 177 etc. of the CrPC and therefore the place or situs where the Section 138 Complaint is to be filed is not of his choosing. Supreme Court in Dashrath Rupsingh Rathod Vs. State of Maharashtra & Anr. Overruled the two Judge Bench Judgment in K. Bhaskaran v. Sankaran Vaidhyan Balan (1999) 7 SCC 510 wherein it was held that “the offence under Section 138 of the Act can be completed only with the concatenation of a number of acts. A two Judge Bench of the Supreme Court recently dismissed the Special Leave Petition as withdrawn, filed against the Bombay High Court Judgment which held that dis-honour of “AT PAR” Cheque cases can be filed to the Court within whose local jurisdiction the nearest available branch of bank of the drawer situated explaining the Apex Court Judgment in Dashrath Rupsingh Rathod vs. State of Maharashtra. Earlier Supreme Court had stayed the Bombay High Court Judgment. It was in Ramanbhai Mathurbhai Patel vs State of Maharashtra, Justice M.L.Tahalyani explained the dictum in Dashrath vs. State of Maharashtra in which a three Judge Bench of the Supreme Court held that dis-honour of Cheque cases can be filed only to the Court within whose local jurisdiction, the offence was Committed; ie, where the cheque is dishonoured by the bank on which it is drawn.